For my soul delighteth in the song of the heart; yea, the song of the righteous is a prayer unto me, and it shall be answered with a blessing upon their heads. Ours is a hymnbook for the home as well as for the meetinghouse. We hope the hymnbook will take a prominent place among the scriptures and other religious books in our homes. The hymns can bring families a spirit of beauty and peace and can inspire love and unity among family members. Hearken unto the voice of the Lord your God, while I speak unto you, Emma Smith, my daughter; for verily I say unto you, all those who receive my gospel are sons and daughters in my kingdom. [...] And it shall be given thee, also, to make a selection of sacred hymns, as it shall be given thee, which is pleasing unto me, to be had in my church. This commandment was given only three months after the Church was organized. The compilation contained 90 songs. Only the words for the songs were printed in the book, and during meetings, they would sing the words to various known tunes. Often they would sing different songs to the same tune. Emma Smith’s compilations served the church for many years; sometimes, new songs would be added. In 1886, the President of the Church, John Taylor, asked five prominent LDS musicians to come up with music for all of the songs in the current book. Three years later they had finished, and published Latter-day Saint Psalmody. This hymnbook was the first in the Church to have both text and music for the songs. The hymnbook used by the Church today is called simply, Hymns and is available online. It was first published in 1985, and it contains 341 hymns; 26 of which are from Emma Smith’s original compilation. This hymnbook is being used as the starting point for translating the songs into other languages. Hymns has been translated into 21 languages and other translations are in progress. Music, both hymns, and popular music has played an important role in Mormon culture in many other ways. The Mormon Pioneers often sang during their trek west. In fact, a revelation given through Brigham Young encouraged the pioneers saying "If thou art merry, praise the Lord with singing, with music, with dancing, and with a prayer of praise and thanksgiving" (Doctrine and Covenants 136:28). Mormons have often written songs for important events like temple dedications and holidays. Once in Utah, Welsh immigrants created a choir, which has become internationally known as the Mormon Tabernacle Choir. Mormon colonies in the nineteenth century, no matter how small, usually had a town band. Even today many Mormons learn to play an instrument, and reverent musical numbers are a frequent part of worship services. 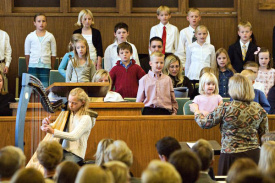 Each Mormon congregation is encouraged to have a choir, and congregational hymns are sung at virtually every meeting. In more recent times, Church leaders have encouraged parents to include musical training in the lives of their children. Members are also encouraged to use good music as a way to control unwanted or degrading thoughts. Mormons are counseled to avoid listening to degrading music, but as usual, it is up to the individual to distinguish between uplifting and degrading music. The hymns are not the only source of good LDS music. There are hundreds of members who write inspirational music available to others through CD's, printed music, and sometimes even through the Church magazines. One of the largest websites offering LDS music is Mormon Music. This page was last edited on 12 June 2017, at 12:45.